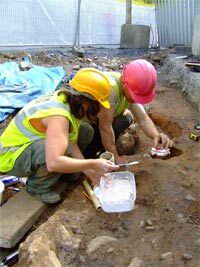 Before the MacDonagh Junction shopping centre was built Kilkenny Archaeology carried out a series of excavations which led to the discovered of a previously undocumented artisan’s quarter of medieval Kilkenny. The excavation site lay 200m outside the town wall of the medieval suburb of St. John on the east side of the city, and immediately adjacent to the site of the main market place of the town at St. John’s Green. A number of property plots were documented and these were occupied by bakers and potters; both these trades were highly hazardous, which is why they were carried out well outside the city walls. The pottery production centre is only the sixth site of its type to be found on the island of Ireland and comprised a kiln, workshop, a pot-drying kiln and numerous pits that were dug to provide clay for the vessels. A revolutionary new technique for dating was used (archaeomagnetic dating) and this showed that the kiln was used between 1325-1375. Ten thousand artefacts were recovered, most of which were the remains of the jugs (top left), plates and cooking vessels that were made on the site. A particularly interesting discovery was an ‘ear-scoop’ which was used to remove wax from the ears!